Letters to Jack: Eleven Months. | The girl who loved to write about life. First things first, I can't believe that the next time I write one of these letters, you will be an entire year old. I feel like I've known you forever, but man can a year go by fast. Month ten was the most fun we've had yet. We had Thanksgiving, we went to universal, you met (and pretty much hated) the Grinch, we've watched Christmas movies, gone and looked at lights, and just had the best time. Every single day you are more and more aware. 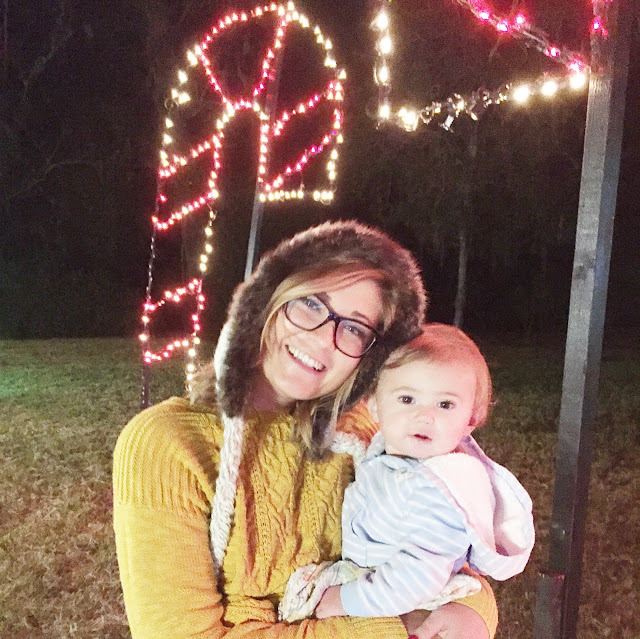 When we took you to look at Christmas lights, I could tell you were really taking it all in. You would turn and stare at lights, and after a few seconds of staring the biggest smile would slowly creep across your face. It was a moment I will never, ever forget. I hope you always stay this curious and in awe of the world around you. To say I am excited about the next two weeks is a massive understatement. YOUR FIRST CHRISTMAS. Chris and me and you and Gatsby are going to have the best day ever. I know you won't remember it, but I hope that you feel happy. And loved. Because you are so, so loved. Sorry in advance for making you take pictures with Santa. If meeting the Grinch is any indication, you're not gonna be too happy about that. But hey, we all have to take one for the team every now and then. I love you more than life, you silly, stinky, hilarious little babe. You have brought a whole new meaning to joy this year.